This week, we are having many exchanges concerning our responsibility as Christians in our societies. At the same time, we are going together to the sources of faith, by means of common prayer and meditating on Scripture. Human responsibility and the search for God, these two realities are so inseparable. It is the third year that we are holding such a week of deeper searching on the hill, supported by the very precious presence of speakers from various backgrounds and to whom we express our gratitude. I will mention only one by name: the beloved Jean Vanier. And I would like to say right away that we will continue. Next year, from the 19th to the 26th of August, we will have another week like this one. All of us, I am convinced, would like to see fraternity grow around us in order to prepare peace. In this we can cooperate with many others, and notably with those who do not share our Christian faith. Help fraternity to grow! In the fourth of the proposals we make to young people for 2017, you find some suggestions for a commitment in this direction. There are commitments that are within everyone’s reach. For example, there is the enormous challenge of the number of migrants, which is exploding. To face this challenge, many people are working together, in the Church as well. For parishes, for groups of Christians, this collaboration brings a new breath of life. What is being asked is much more than helping others. The Gospel invites us to discern Christ, the presence of God, in the poorest. 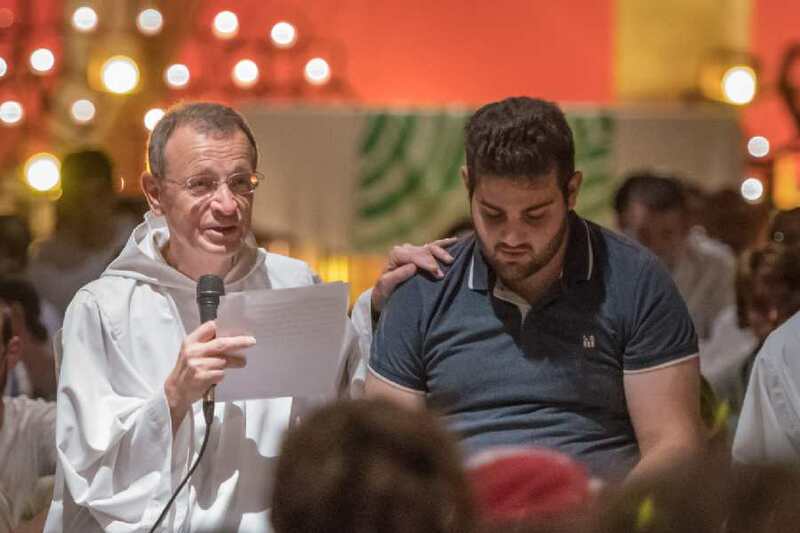 In Taizé, by welcoming refugees, I can testify that we receive more than we give. They have experienced so many trials, and so they stimulate us to traverse our own difficulties with courage. I often tell them: God has sent you to us. Making fraternity grow begins right beside us, at our door. We need to go beyond the barriers that can spring up very close to us. We can go towards those who are wounded by life. We can listen to a homeless person, a person with a disability, a sick person, a refugee, tell us their story. We can create friendship. We can also open ourselves to other cultures and mentalities. We can share with those who think differently than we do, building bridges between religions, between European countries where mutual understanding is increasingly lacking, between continents. With creation too we would like to live in fraternity. Justice between humans and a just use of the resources of our planet are linked. As long as we savagely exploit the resources of the earth, there will be no peace among human beings. We need to see the beauty of this call to fraternity with creation, since we are linked to all that exists. Some of you will struggle for more generosity to express itself in laws and institutions, because generosity needs structures to be effective in the long term. These people will not give up political struggle; they will take part in the decision-making process in their countries. In order to deal with the adversities that may arise along the way, it is important to examine our motivations. How does faith become a source of hope for our commitment? Without prayer, without constantly deepening our knowledge of God, of Christ and of the Holy Spirit, our lives dry up, our commitment runs the risk of being too self-centered, discouragement menaces us more easily. Last Sunday, we remembered that Brother Roger arrived in Taizé for the first time on 20 August, 20 August 1940. From the beginning, he was aware that a life of prayer was inseparable from compassion and solidarity with those most abused by existence, at the time the war refugees that he hid. Even when alone, he prayed three times a day. These days we sing words that were already important to him in those long-ago times: "Blessed is the one who abandons himself to you, O God; you keep us in joy, simplicity and mercy." It is always in this same spirit—joy, simplicity, mercy—that on Saturday evening our brother Hendrik will say to Christ a yes forever, committing himself for his entire life in our community. He comes from the Netherlands and has lived with us for nearly six years. He has prepared himself for a long time to follow Christ. His family has come to be part of this beautiful event. I shall conclude by referring to a more personal experience of the past few days. Someone very ill told me, "I love life". I was stunned. We all know such moments when a few words touch us deeply. This person, bound by the very narrow limits of the disease, took me out of my own narrowness. I was stirred not only by his words, but by the beauty of his expression. "I love life". Such words can awaken in us an awareness to beauty, poetry, art and music. Among the workshops this week there were two a beautiful concerts on the piano and the organ. Cultivating this sensitivity to beauty—the beauty of nature, too—is essential. I would like to say again that this week, like last week, we are in special communion with the young Africans gathered in Algeria. Many young people from different African countries study in Algeria, it is difficult for them to obtain visas to come here, so every summer two weeks of meetings like in Taizé are organized with them in the city of Tlemcen. Good evening, I am Theodore, 20 years old. I am from Lebanon, an Arabic country. I am here as a volunteer for almost two months. I received my invitation through the orthodox youth movement” part of the Greek Orthodox church of Antioch. I will just tell you a short story. I live in the north of Lebanon, precisely in El-Mina city, the port of Tripoli, in one of the most demographically diverse cities, mostly populated by orthodox Christians and Sunni Muslims, with lots of Catholic churches and other Muslim confessions. I was raised with Muslim and Christian friends living all together like brothers such as Ziad, a Muslim. I grew up with him in the same school, his father owned a fishing tool shop just next to my house. So whenever I wanted to go anywhere, I passed by him to say hello and to have some talks. One evening I was walking on the seaside road with some friends from outside Mina, and I was explaining to them how Christians and Muslims are living together. Suddenly two young men who were listening to our conversation came up and presented themselves: “my name is Mohamad and this is my best friend Anthony, we are Muslim and Christian, and we agree completely!” We all laughed blissfully. A perfect example of what I wanted to share! Currently we are participating in a reconciliation program in Tripoli between all the religious people from different religions and confessions. The fact that my father is an orthodox priest makes me feel very concerned and touched by this movement of sustainable peace in my city. We hope to make it a good model to all our neighbouring regions and countries. Differences should not separate us but help us converge to a rich, diverse life of solidarity.